We have found that some of our clients forget to pay the annual fee. We believe that it may be suitable for some companies to pay the 10 year fee instead of an annual fee. Clients with a company will receive an annual review each year on its registration date. 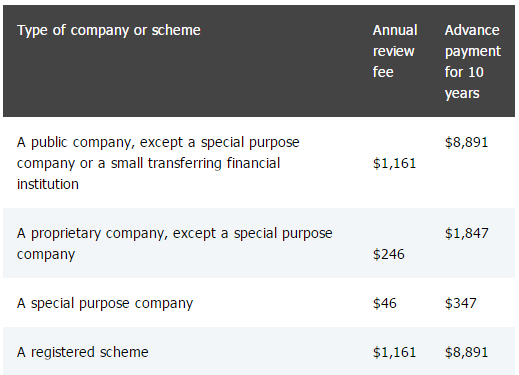 You will receive a statement and an invoice for the company’s annual review fee which you need to pay to ASIC. This statement will show the current information from the ASIC register such as name of officeholders, registered address, share structure etc. You should review the information in the annual statement. If it is correct then you don’t need to lodge anything or even send the annual statement back. You have two months from the review date to pay the fee. If some of the information is not correct, you should notify us of any changes to be made. We are able to notify ASIC on your behalf as your registered tax agent. There is a 28 day lodgement period from effective date of change. Late lodgement fees or late review fees apply if lodged late. If you do not notify us of the correct information within the 28-day review period, the company will be charged a late review fee as stated below. Late payments also incur the late fees included below. If you incur late fees you must still pay the annual review fee. You have two months to pay the annual review fee. Hint: Set yourself a reminder to pay annual fees as it is easy to forget when you have two months to pay. Alternatively pay the annual fee as soon as you receive the invoice.